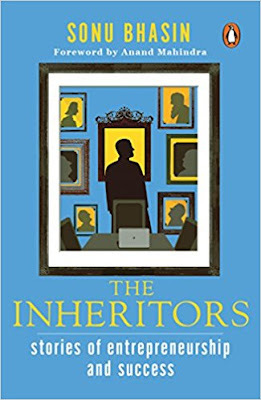 The Inheritors dawned on my radar as I was browsing through Amazon. The book written by Sonu Bhasin with a Forward by Anand Mahindra appeared to be a unique product about the Indian entrepreneurial setup. The term ‘Indianness’ arises often in the Indo-Anglian literature. Certain writers attempt to describe the term too. I doubt that anyone of those critics or writers ever defined the term properly. The Indian way of writing, along with the Indian way of performing various other cultural, political, and sociological activities is unique. It cannot be seen as a copy of or a direct oppositional force set against a Eurocentric system. The Indian way incorporates the best in every culture and social system. It also distinguishes itself from all those streams from which it drew inspiration. Sonu Bhasin’s attempt is to delineate the major Indian way of doing business. She does that by telling the stories of many family-owned businesses in India. Sonu Bhasin introduces a unique project in the form of The Inheritors. In six readable, lucidly written narrative chapters span a story that makes up the six pillars of the Indian market space. These businesses are family-owned. However, Sonu Bhasin sets a working angle to the story through the eyes of the decedents of these families. The first chapter is titled “Dabur Group and Lit Bite Foods: Amit Burman”. This chapter moves through the life of Amit Burman the young entrepreneur from the Dabur family that took the charge as Vice Chairman at Dabur India. After his higher education abroad, Amit returns to India to work at Dabur, his family business. After working in several departments with his company, he realizes that his calling lay somewhere else. So he ventures into the world of startups. This is the story of a young man who finally finds harmony with his family business, by adorning the space of its Vice President while at the same time initiates a path-breaking set of ventures in the food industry of India. The second chapter is “Marico: Harsh Mariwala.” As the title suggests, the second chapter of The Inheritors deals with the journey of Harsh Mariwala who feels at one point that he is in control of his future. He founded the company named Marico and you read about that journey too. The third chapter “Berger Paints: Kuldip Singh Dhingra and Gurbachan Singh Dhingra” and the fourth chapter “Motilal Oswal Group: Motilal Oswal and Raamdeo Agrawal recount the tales of family-owned businesses that made it big even beyond the previous two entities in the Indian market. “Berger Paints is the second-largest paint company in India today” (113), Attests Sonu Bhasin. In the hands of the fourth generation of the Rangwala family, Kuldip and Gurbachan keep on delivering their best in continuing the legacy of their brother Sohan Singh Dhingra who is the progenitor of the business. This chapter also focuses on how the interpersonal relations between the two brothers, Kuldip and Gurbachan help them grow the company. The key players in the Motilal Oswal Group, Motilal and Raamdeo are not families but friends taking their friendship to new levels of productive meaning. Other chapters include “Keventers: Agastya Dalmia”, “Max Group: Tara Singh Vachani”, “Cyril Amarchand Mangaldas: Rishabh and Saloni Shroff”, “Luxor: Pooja Jain”, and the “Select Group: Arjun Sharma”. Author Sonu Bhasin has effectively tied the chapters into this volume. The Inheritors will leave a deep impression on the reader, for sure. This deep impression would make the reader picture himself or herself to be the inheritors of the spirit of entrepreneurship. Portfolio Penguin, an imprint of Penguin Random House published The Inheritors. This book is sure to reflect what every budding entrepreneur of India expects. It’s clearly a good package full of practical lessons and stories that could serve the launch pad for inspiration in the lives of wanna-be entrepreneurs.